I feel refreshed and ready to start the week! So as usual, I'm linking up with Biana and Meghan for a weekend recap! ONE | The weekend started as it usually does... John comes home from work, and as soon as the sun starts to set, we take Scout for a walk. My husband decided to bring his fly rod along on the walk (which I thought was strange), until halfway through he informed me that he was going to fish on a golf course pond. Our condo backs up to a golf course and John claims that he often sees fish rising. Needless to say I was not interested in a trespassing ticket, so I did not join him on his fishing excursion. TWO | John and I have been watching the TV show 24, and I'm surprised by how much we are enjoying it! We had a mini date night with yummy cheeses and crackers to finish off season 1. THREE | Ladies and Gentlemen - I did it... this weekend I actually meal planned! I sat down with my girl Ina, and made a list of 4 meals that I will be making at home this week. Not only that, but I made my grocery list and went and bought everything but the meats. FOUR | Saturday night we took Scout to the dog park to swim. John and I are such proud puppy parents when we see Scout doggie paddling around. And let me tell you, Scout has a blast. She gets super crazy when she is done swimming and runs around like a mad dog. And get this, when we were leaving the park I ran into an old coworker who I worked with in Ann Arbor - pretty small world considering we are almost 2,000 miles away from Michigan! FIVE | The weather this week is going to be hot, hot, hot! Like, REALLY hot - the high for Thursday is 115! To escape the heat, John and I decided to take a day trip to Flagstaff on Sunday. The weather was beautiful - a high of 84 and no humidity... and only a 2 hour drive. Not too bad if you ask me! 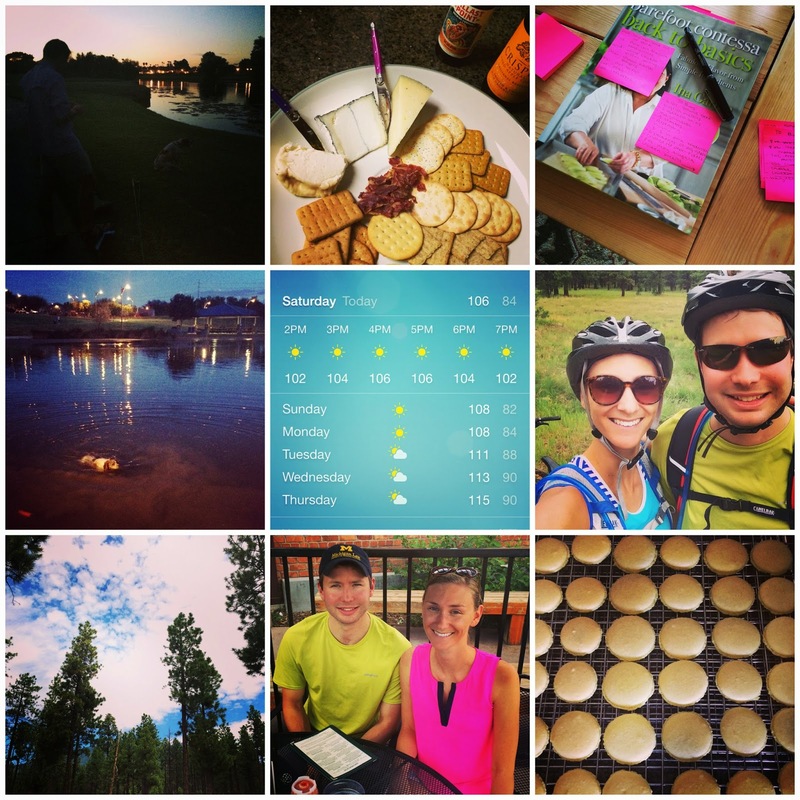 SIX | We brought our mountain bikes to Flagstaff and it was so nice to be able to exercise in some decent weather. We decided to ride a trail on Mt. Elden and it was awesome! It was about 3 hours long, and although the assent felt pretty long, the decent was a blast. SEVEN | Arizona is a pretty cool place - there is a ton of varied scenery. Before moving here I thought it was going to be super flat, and it really isn't. Flagstaff is at about 7,000 feet, and the highest mountain in Arizona is over 12,00 feet. John and I are pretty excited to continue exploring and hopefully get in some hiking soon! NINE | The weekend finished with a little Kitchen Aid Mixer fun... I made French macaroons! And surprisingly, they were pretty easy - I followed the recipe exactly, and they turned out great! I was so excited that I made two batches: almond and mint-chocolate. Recipe post coming soon! It looks like you had such a fun weekend!! I cannot believe those temps...a low of 90 sounds miserable. Yay for meal planning, sitting down and writing out a list is 90% of the battle. Happy Monday! I love to hear about your exploring (sorry I need to catch up; I've been sick) especially because I'm about to move again! What a fun weekend! I didn't get into 24 when the show premiered a while ago, but may have to start watching from the start on Netflix lol!! I'm not sure if I could survive in that type of heat - but at least its dry heat right!! Thanks for linking up!! Fishing the in the golf course pond - too funny. Glad to hear Scout is doing great in AZ! So jealous you have a kitchen aid mixer! Enjoy exploring! Sounds like you had a great weekend. And temps to 115?! Wow!!!! Love all of those pictures, y'all are so outdoorsy! I definitely don't have that gene. haha! Especially in 110+ degree heat! Love a good trip to a brewery though, I could get on board with that! Meal planning is such a great tool. That is the only way we manage to somewhat stick to our food budget. Looks like you had a fun weekend. Arizona is some place I always wanted to travel. it's so different than Rhode Island. I'm glad I get to read your adventures. The macaroons sounds delicious! Good luck with sticking to the meal plan, I always mean to do that and never get around to it! Glad you are enjoying your new surrounds, but man I'd melt in 115! I wish I had the time, patience... & smarts... to meal plan. It would make life easier, I'm sure. Yay for meal planning! I'm terrible at it. Puppy swimming is the best! Happy Monday! i love that you made french macarons! im so impressed -- they look great! xo jillian - stop by cornflake dreams, I'm hosting a giveaway! The hardest part of meal planning for me is actually sticking to the plan. lol. Good luck! I am so impressed you made macaroons! I've heard they are hard to make. Looks like a fun weekend and you are lucky to be able to explore Arizona! One of my fav places that I've visited there is Canyon De Chelley. Check it out if you have the chance! Ina is my go-to also!! I need to sit down and do some meal planning too!! Looks like a fabulous weekend! I have always meal planned and found it works well, it helps me not spend too much at the grocery store on things that won't make a meal up. Sometimes it is hard to stick to it, but there's always tomorrow if you end up skipping a day! Hope your enjoying your mixer! Macaroons are quite a challenge!! Nice job! Lisa! I LOVE me some macarons! I cant wait to see your recipe! Maybe I will try to make some myself! Can't wait for that recipe- yum!! What a great weekend! Flagstaff sounds like a perfect getaway. Love that Ina - her cookbooks are the best! I'm so glad you guys had a good trip, and escape from some of the heat, in Flagstaff! What a cool place to bike ride! I need to start meal planning better- it's always so much more pleasant around dinner time when I do! I love the show 24--hope you enjoy watching the rest of the seasons. Hope you are staying cool in that heat! It's going to be hot in Michigan today, but not as hot as where you are! Wow! Macaroons scare me. I've heard they're hard to make so this is encouraging!